To celebrate World Book Day, this blog takes a look at how to provide the right lighting for reading at home. World Book Day is marked in over 100 countries around the world and is a celebration of books and reading. Its mission is to instill a love of reading in young people which will hopefully last a lifetime. In the UK children are given book tokens which they can exchange for a book of their choice. Schools have special events often with the children dressing up as a character from their favourite book. Now in its 22nd year, World Book Day this year falls on 7 March 2019. I expect most of us were told, when we were younger, that reading in poor light would damage our eyesight. In later years, when many of us wear glasses, we still feel guilty about the times we spent reading under the bed covers by torchlight! Doctors however agree that reading in low light levels does not ruin our eyesight as most eyes simply worsen as part of the aging process. 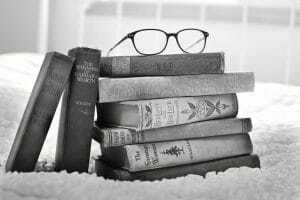 However, reading in poor light can result in short term effects such as headaches and eye strain. A reading light can be used not only for reading but also for writing, working on a computer, craft work and other detail focused activities. These lights, known as task lights, illuminate a small area usually from a close distance. Be aware of the colour temperature of the light – this is a way to let us know what the look and feel of the light will be. Have you noticed what a difference the colour of the light can make? For instance, the lighting in a supermarket is usually strong, bright and white whilst your local pub has a more, warm yellowish light. Colour temperature is measured in degrees Kelvin. For a warmer feel look for 2000-3000K or for a cool crisp white go for 3100 to 4500k. This information should be quoted by the on-line retailer or shown on the bulb packaging. Light fittings or bulbs with a warmer colour temperature are easier on the eyes that those in the cooler range. The reading lights you choose will depend very much on where and when you plan to use them so let’s have a look in a bit more detail. 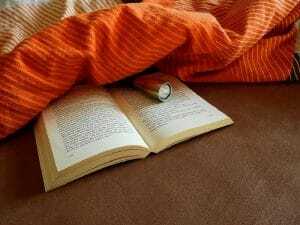 Many of us enjoy reading a good book in bed before we go to sleep but do not want the hassle of having to get out of bed to turn the light off. 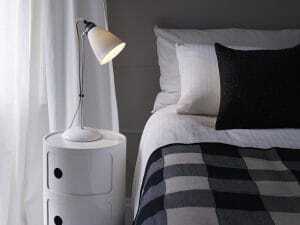 A suitable reading lamp that can be switched from bed is the ideal answer. It should be just bright enough to provide the reader with a comfortable amount of light. There is certainly no point in lighting the whole room – an extremely bright light at this point can confuse the brain into thinking it is daylight which may cause difficulty sleeping. Reading lights for the bedroom can be wall lights fixed to the wall over the bed, bedside table lamps, floor lamps, clip on lamps or even pendant lights hung beside the bed. There are styles to suit both traditional and modern interiors. Hotels know a thing or two about bedroom lighting so take a leaf out of their book, so to speak, and opt for a sleek modern boutique look. The Enna book reading light (shown left) has an adjustable head and is switched on the back plate. It is supplied with a long lasting, integral 4.4 watt LED bulb which provides a narrow concentrated beam of light perfect for reading in bed without disturbing a partner who wants to sleep. 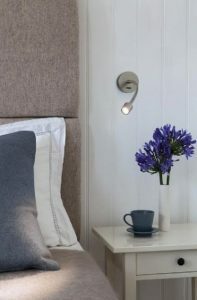 The Park Lane wall light (in the centre) offers the best of both worlds with a conventional wall light and a flexible arm LED reading light on the same fitting – available in a choice of metal finishes and shade colours. The Fosso (on the right) is a super little LED reading light with a bendy flexible arm that will give a comfortable light for reading in bed. Being an LED light this fitting is cool to the touch and would be safe to use in a child’s bedroom. All these lights are very low energy and economical to run. 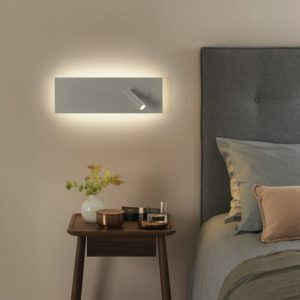 Looking for a practical solution to bedside lighting?, The Belmont wall light fitting shown here incorporates a wall light with 2 directional LED book lights which are switched separately on the back plate for ease of use. 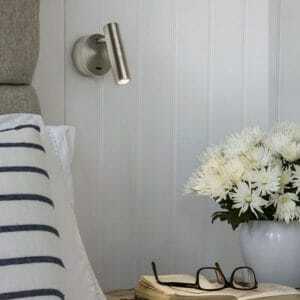 If you would like an over bed wall light but do not have the necessary wiring in place then this retro style clip on light could well be for you. 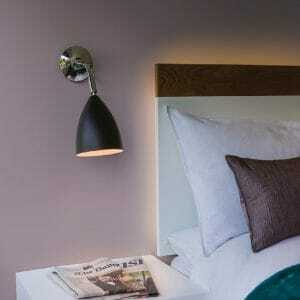 A versatile and practical light designed by UK manufacturer Original BTC. It has an adjustable, translucent bone china shade in natural white and is supplied with a 3 pin plug, a long braided cotton cable and a peg-like clip. Simply plug into the nearest socket and attached the peg to a shelf, table or other suitable surface. A relaxed style that can easily fit into traditional or modern interiors. The Joel retro style wall light shown left is another offering from British manufacturer Original BTC. This comprehensive range of lights includes matching table lamps, floor lights and pendants. Elegantly proportioned with a stylish, minimalist appearance and available in a choice of finishes. With its angled shade this fitting can be used just as effectively as a task wall light by a desk or workstation. 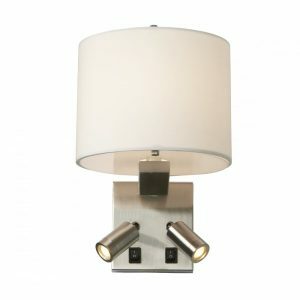 The modern Edge hotel style wall panel light on the right has a dual light source with a back lit wall panel and an adjustable LED book reading light offering versatile lighting options. 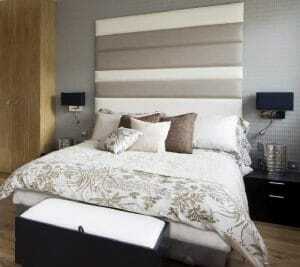 In neutral white, which can be incorporated into most colour schemes, it can be fitted vertically or horizontally. 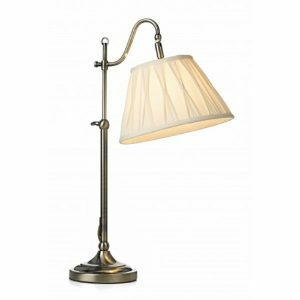 Bedside table lamps offer a more traditional look for period interiors and there are any number of table lamps that can be used as bedside table lamps. In addition to choosing lamps that compliment your decor, there are a few extra considerations to bear in mind if you will be using the lamps to read in bed. The lamps should be tall enough to give a good spread of light across your book or tablet. In order to achieve this the lampshade should be between shoulder height and just below eye level when you are sitting up in bed- this will ensure you light your reading area without the light causing glare. Much will depend on your height as well as the height of your bedside table and mattress. Ideally your bedside table should be of a similar height to your mattress and if this is the case a table lamp that is between 60-69cms in height would be ideal. The three table lamps above are all suitable for traditional interiors. The popular Suffolk antique brass table lamp, on the left, has a pinch pleated cotton shade that can be angled and adjusted for height too, making it a great choice as a bedside table light. It has an in-line rocker switch on the cable that can easily be turned off from bed. In the centre is the tall slim Sloane table lamp in a hammered pewter finish with an ivory silk shade lined in reflective silver laminate. This lamp is made in the UK by David Hunt Lighting and with matching ceiling lights is a good option for a coordinated look in the room. The Sloane range can be customised with different coloured shades. On the right is the Rochester lamp in antique brass with a clear textured glass shade. This is a touch lamp with a three stage built in dimmer operated by simply touching the metal base. A great option of anyone who has trouble with the usual push bar switches on table lamps. 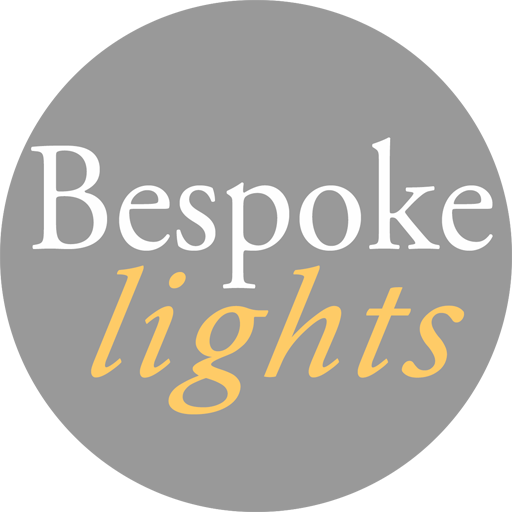 When choosing suitable reading lights for a lounge or sitting room there are a variety of options. Huge, wide arc floor lamps and standard lamps are a good option for lighting over chairs and sofas. 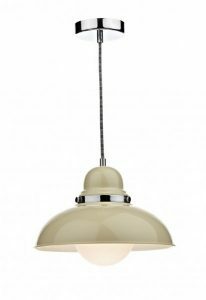 The retro style Dynamo light fittings shown above are available in a choice of finishes and the wide arc table and floor lamps have shades that can be angled. 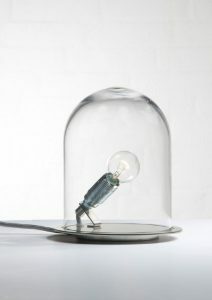 The dome shaped pendant in the centre can be hung over a favourite armchair or settee. To find out more about these lights simply click on the images. 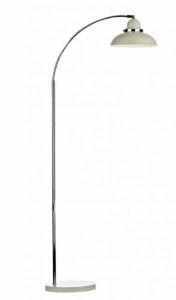 The aptly named Task floor lamp does what it says and provides illumination exactly where it is needed for the task in hand. 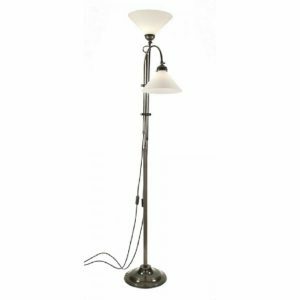 A good looking floor lamp designed and made by British lighting company Original BTC with simple clean lines and a non-fussy appearance. This fitting has a long cantilever arm which angles up and down to direct the light where it is required. The Task range includes matching table lamps, wall lights and pendants in a good selection of colour options. For reading in a chair or sofa the light is most effective when delivered over the shoulder on the side of the stronger eye. 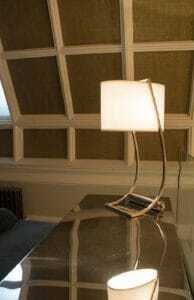 Many floor lamps have adjustable shades allowing the light to be positioned comfortably for reading. 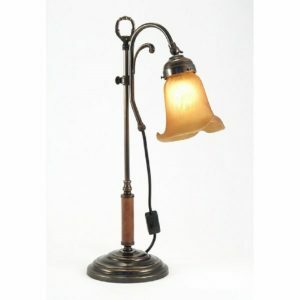 A selection of standard lamps that can be used for reading in sitting rooms. They can all be easily angled and adjusted to direct the light. The modern design Enna floor lamp, on the far left, is perfect for contemporary minimalist interiors. This free standing white floor lamp has a long lasting integral LED bulb that provides a narrow beam of light just perfect for reading. 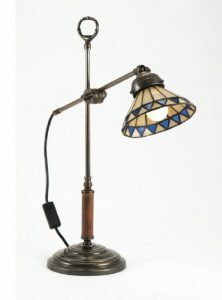 The traditional Gibson standard lamp, shown left, is reminiscent of the old fashioned turned wooden lamps that were so popular during Victorian times. A characterful lamp that can be positioned behind a chair and the swing arms manoeuvred into the correct position for comfortable reading. 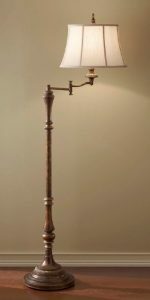 The Suffolk lamp, on the right, is a good quality traditional standard lamp and is a companion to the table lamp sown earlier in this blog. It has both a rise and fall adjustment and a directional shade facility and is supplied with the cotton pinch pleat shade shown. The swing arm standard lamp, on the far right, is the latest addition to our popular Stanford range. With a great range of matching ceiling lights, wall lights and table lamps you can easily coordinate your lighting in style. Available in aged brass and nickel finishes with a choice of different shades. 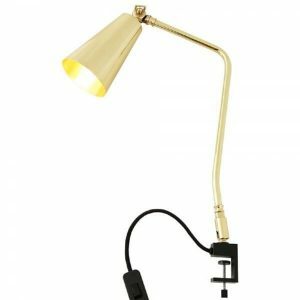 Desk lamps often have multi-directional capabilities and can be sited appropriately in sitting rooms to put light in the right place without looking too out of place. These two lamps are from our Period Lighting Collection which features lights from the late Victorian and Edwardian eras. 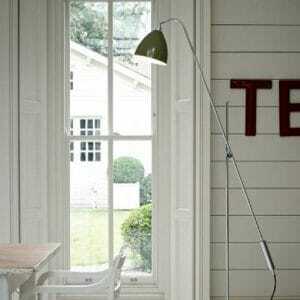 Although they are essentially desk lights they would not look out of place in a sitting room. Made in solid brass with a natural tarnish that is hand waxed and buffed to replicate a restored antique. Both these lamps have shades that can be angled and they also move up and down on the stem. Other shade choices are available. To find out more about these lights simply click on the pictures. Table lamps with fabric lampshades are generally easier to place in traditional interiors and will give warm pools of light. The shades do, however, obscure the light, so unless you have good eyesight you may need to consider more focused lighting to be able to read in comfort. 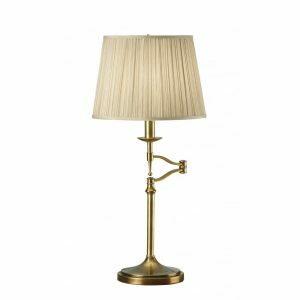 The Stateroom table lamp from our Manhattan American Collection is the epitome of New York elegance and style. 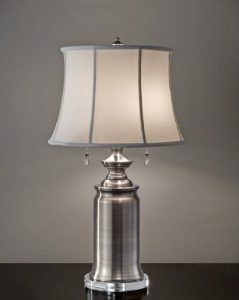 Shown here in the antique nickel finish with a true cotton white linen shade. This lamp has 2 bulbs and the two light pulls allow you to choose whether to have one or both of the bulbs lit – thus giving a brighter light for reading when needed. 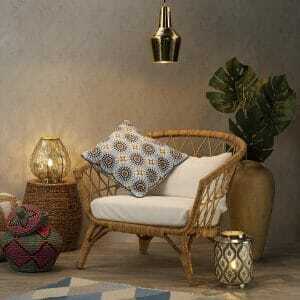 Also comes in a Bali brass finish and there are matching standard lamps too. 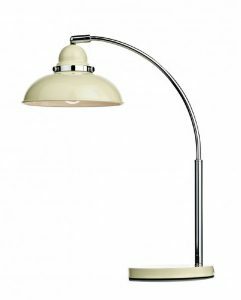 The Stanford table lamp with a swing arm shade. This popular collection of lights, with its refined French style elegance, is perfect for traditional interiors. A companion to the standard lamp featured earlier in this blog. In addition to giving a nice ambient light, the shade can be swiveled into position to give a little extra light for reading. This is a good range of light fittings that include ceiling lights, wall lights, table and floor lamps in either aged brass or polished nickel with a choice of different shades. 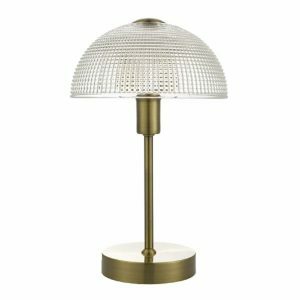 The 3 table lamps shown above all have glass shades which will give a brighter light than those lamps with fabric shades. On the right is the Glow in a Dome table light, an unusual lamp made in Denmark in the classic Nordic style. It is shown here with a clear mouth blown glass shade – other translucent shade colours are available along with matching ceiling pendants. In the centre is the David Hunt designed Aspen table lamp. 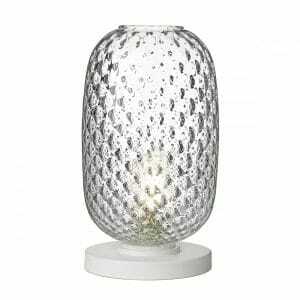 A traditional rustic style lamp with clear conical glass shade. On the left is the Vidro clear textured glass table lamp, another offering from David Hunt Lighting, The shade is hand made in Portugal and finished off here in the UK with a white base. Whilst it is important to have a good light focused on your book it is equally important to compliment this with an even distribution of light throughout the rest of the room. Many people make the mistake of just having a bright light in an otherwise darker room. This means that when your eyes wander from the page your pupils dilate which can make your eyes tire more easily. This is one of reasons we get tired reading in bed at night which is probably not a bad thing. But, maybe, not so acceptable if you are reading elsewhere at other times of the day. One way to get around this problem is to have a mother and child style floor lamp. Mother and child floor lights have a dual light source. The uplighter light, at the top of the lamp, does what is says and shines the light upwards towards the ceiling. For this reason they work best with white or pale coloured ceilings as the light will be reflected back into the room giving a good background light. 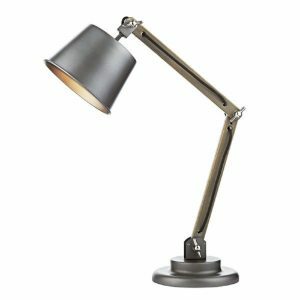 In addition to the uplighter these floor lamps also have an adjustable reading arm that can be used as a book light. 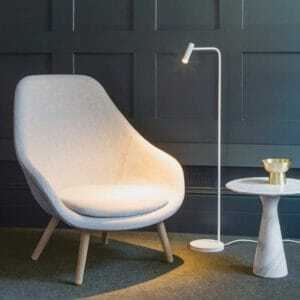 The Hahn mother and child LED floor lamp is in a sleek contemporary style. It incorporates a floor uplighter providing 1296 lumens of light in the warm white colour range along with a flexible arm reading light offering 384 lumens again in a warm white. 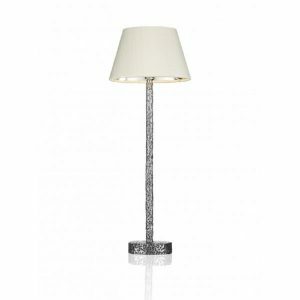 In total this floor lamp offers the equivalent of 160 standard watts. Each light is separately switched and dimmable which means it can be turned down to give a more relaxed light level if you are not reading. It is easy to see why opticians recommend this style of lamp for those who are struggling to read. A traditional standard lamp offering the same flexibility as the more modern mother and child floor lamps. 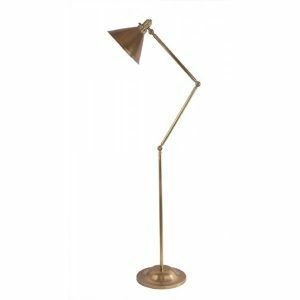 This double headed floor standing lamp is manufactured in the UK and made in solid brass buffed and waxed to replicate a restored antique fitting. Both lights are height adjustable and the shades can be angled to direct the light. Perfect for Victorian and Edwardian settings. 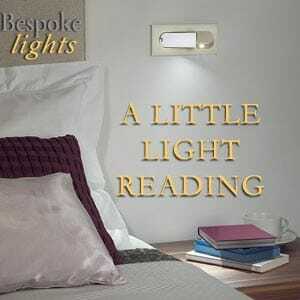 Although we tend to associate wall lights with reading in bed they can be just as effective for reading in living spaces given the right situation. The image here shows our Joel Grande wall light positioned perfectly for reading on the sofa. A versatile fitting with an adjustable cantilever arm and shade that can be angled to direct the light. This cleaver light also comes with a removable plug and cable – this gives the option to hard wire the fitting directly to the wall if you have the necessary wiring or to simply use it as a plug in wall light. 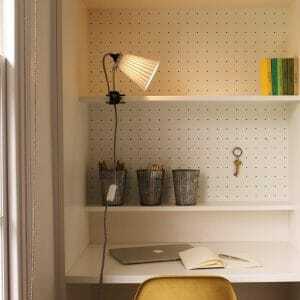 As with reading lights for living spaces it is important when considering reading lights for a desk or study to ensure there is enough background light in the rest of the room. This will help to avoid eye stain and tiredness. Certainly when we think of reading lights for a study or workstation we automatically think of desk lights. Whilst it is the obvious solution to invest in a good quality desk lamp there are also other options. 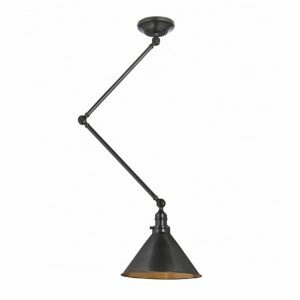 Desk lights are usually small in size and provide focused light, with many having the ability to swivel with flexible arms and angled heads. Try to select one that is sturdy so it remains stable. If your desk, workstation or study has a computer, the desk light should illuminate the keyboard and paperwork but not cause glare on the screen. Constantly changing pixels or a screen with glare puts a huge stain on the eyes, a condition known as ‘’Computer Vision Syndrome.’ There are a whole host of desk lights to choose from so you should have no problem finding one to suit. Here are some of our favourites. 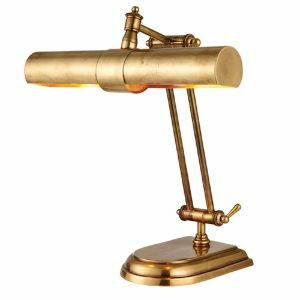 A quality nautical style desk light hand crafted in solid brass with a polished gold finish. 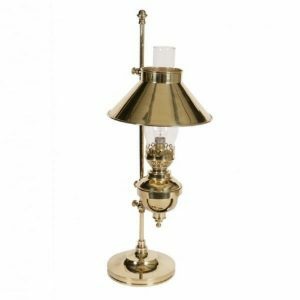 The Captain’s lamp is from our Heritage Lighting Collection and is based on an original design oil lamp from the Captain’s quarters of a coastal steamer from the late Victorian/Edwardian eras cira 1880-1910. Other finishes are available to order and there is a matching wall light. 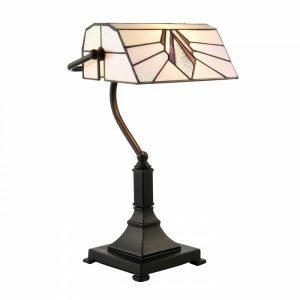 This striking bankers lamp desk light has its typical trough shaped shade in hand crafted Tiffany glass. Very reminiscent of the Art Deco cinema style of the 1920’s and 1930’s with a geometric pattern in inky blue/green and shimmering silver on a white translucent mother of pearl background. The lamp sits on a dark antique square plinth base. Matching ceiling lights and floor lamps in the same range. Definitely one for the Art Deco connoisseur. A classic desk light that simply allows the quality of the workmanship to speak for itself. Hand crafted in solid brass using traditional casting methods and with a mellow finish. It is lacquered to preserve the finish and will only need a light dusting or the occasional clean with a damp cloth to keep its good looks. The shade can be angled and locked into place to direct the light. There are matching wall lights and picture lights to bring a coordinated look to a home study or library. When we come to install lighting in a study or work space at home most of us would not want to replicate the lighting found in commercial offices. Quality and character are more important to us – it is our home after all. Luckily there is a whole range of home lighting on offer that is designed for home offices and workstations. Here are a few more contemporary desk lights. The Arken desk light is full of vintage character and mid-century good looks, perfect for creating a more relaxed informal look. Stylish details include wooden arms, black cable and a soft sheen grey metal base and shade. The arms and the shade are both adjustable and can be locked into place using the little wing nuts. 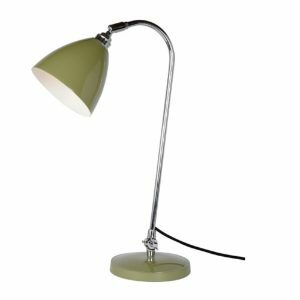 A funky desk lamp in a modern pared back industrial design that makes a great task light suitable for reading or craft work. It is fully adjustable and available in a choice of metal finishes. Hand made in Ireland from solid brass and steel and shown here in white with a powder coated vibrant orange shade. A handsome funky little number with a retro feel. 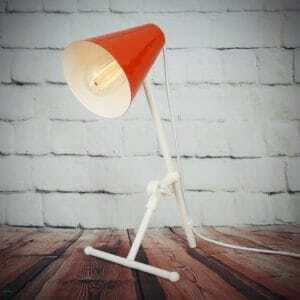 This functional desk lamp is made by British lighting company, Original BTC. Their well made lights have a relaxed non-fussy appearance with simple clean lines and the Task Solo lamp is no exception. It is shown here with an olive green aluminum shade and base with a chrome arm and is adjustable to direct the light. A super little desk light or bedside table lamp. 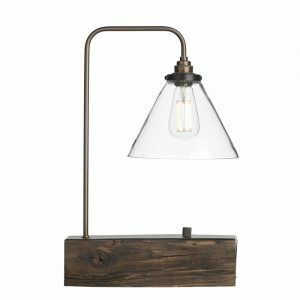 We love this versatile Lex desk light that combines modern beauty with function. It has an open shelf that will support a book, tablet, IPad or other portable device. It also incorporates a USB port at the back that will allow you to charge the battery on your device without having any extra wires cluttering up your desk. If space it at a premium there may not be enough room to accommodate a desk lamp and if this is the case you could opt for an adjustable or angled wall light, a clip on shelf light or a floor lamp. Carefully selected these will give your good directional light for reading or other close work. These two versatile light fittings take their inspiration from the French cafe style lighting of the mid 1900’s. They will happily fit in both traditional and modern interiors and are available in a choice of finishes, with other matching lights also on offer. The Provence floor lamp is fully adjustable and can be angled at the three knuckle joint to put the light exactly where it is needed. The dual purpose Provence ceiling pendant also doubles up as a wall light and angles in the same way as the floor lamp. The floor lamp is in the aged brass finish and the ceiling pendant/wall light is in the old bronze. 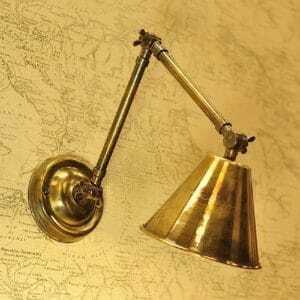 These quality wall lights are made in solid brass with a traditional aged brass patina. 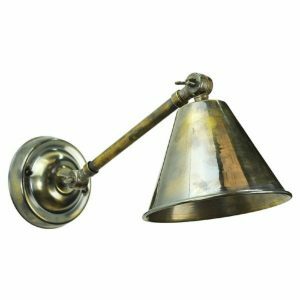 The Map Room range includes a selection of wall lights and ceiling pendants and, as the name suggests, they take their inspiration from the War Rooms of World War 1. The fittings are supplied with long lasting LED spotlight bulbs which provide a light output of 350 lumens and are adjustable through a 150 degree axis at the knuckle joints. Both ideal for using on a wall over a table or desk. Our final two wall lights are both portable. These are versatile task lights that can be moved from place to place and put away when not in use. Simply use them as required to provide additional light for reading. They both plug into sockets and can be attached to a shelf, table or other suitable surface. A perfect solution if you do not have the necessary wiring to fit normal wall lights. Mention clamp -on lights and you would probably think of unattractive garage work lights that you would certainly not entertain in your home. Although inspired by industrial clamp lights, these are chic modern interpretations with sophisticated designs. The Hector clip-on light (above left) is from well respected UK lighting manufacturer Original BTC, who design stylish and practical light fittings using the best of materials. This fitting has a delicately pleated adjustable shade in translucent bone china and is supplied with a long braided cotton cable and a 3 pin plug. The Georgetown clamp light (above right) is made in Ireland from solid brass with a gold polished finish – simply fix the G clamp base onto a desk or table, plug it in and use the metal swing arm and adjustable shade to direct the light where it is required. Takes up minimal space and can be put away when not in use. Each one of us is unique and our eyesight and preferences are very different. We all spend a lot of money on comfy beds, sofas, chairs and possibly reading glasses so we can relax with a good book, yet we expect our eyes to cope with conditions at home that would be totally unacceptable in the workplace. Your eyes should let you know if it is time to take a fresh look at the lighting you are providing for reading at home and we hope this blog has given you some ideas. How to select the right task lights for reading at home. 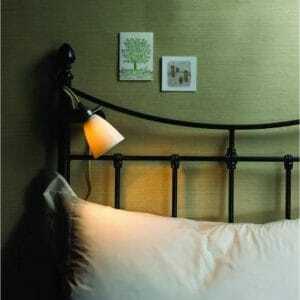 Over bed wall lights and table lamps for bedrooms and desk lights for home study.